Inactivaion of tumor suppressor genes (TSGs) by promoter CpG methylation frequently occurs in tumorigenesis, even in the early stages, contributing to the initiation and progression of human cancers. Deleted in lung and esophageal cancer 1 (DLEC1), located at the 3p22-21.3 TSG cluster, has been identified frequently silenced by promoter CpG methylation in multiple carcinomas, however, no study has been performed for lymphomas yet. We examined the expression of DLEC1 by semi-quantitative reverse transcription (RT)-PCR, and evaluated the promoter methylation of DLEC1 by methylation-specific PCR (MSP) and bisulfite genomic sequencing (BGS) in common lymphoma cell lines and tumors. Here we report that DLEC1 is readily expressed in normal lymphoid tissues including lymph nodes and PBMCs, but reduced or silenced in 70% (16/23) of non-Hodgkin and Hodgkin lymphoma cell lines, including 2/6 diffuse large B-cell (DLBCL), 1/2 peripheral T cell lymphomas, 5/5 Burkitt, 6/7 Hodgkin and 2/3 nasal killer (NK)/T-cell lymphoma cell lines. Promoter CpG methylation was frequently detected in 80% (20/25) of lymphoma cell lines and correlated with DLEC1 downregulation/silencing. Pharmacologic demethylation reversed DLEC1 expression in lymphoma cell lines along with concomitant promoter demethylation. DLEC1 methylation was also frequently detected in 32 out of 58 (55%) different types of lymphoma tissues, but not in normal lymph nodes. Furthermore, DLEC1 was specifically methylated in the sera of 3/13 (23%) Hodgkin lymphoma patients. Thus, methylation-mediated silencing of DLEC1 plays an important role in multiple lymphomagenesis, and may serve as a non-invasive tumor marker for lymphoma diagnosis. Epigenetic silencing of tumor suppressor genes (TSGs) by promoter CpG methylation and histone modification has been widely recognized as one of the major causes of tumorigenesis including hematological malignancies [1, 2]. Aberrant methylation of TSG is frequently detected even in the early stage of tumorigenesis, suggesting its potential as tumor biomarker for early detection and therapeutic targeting. Deletions of the 3p22-21.3 region have been identified as one of the earliest molecular events in various malignancies , including naspharyngeal , head and neck , lung , gastric , breast , cervix  and renal  carcinomas, as well as lymphomas . A growing number of TSGs, including RASSF1A[12, 13], BLU/ZMYND10[14, 15], and CACNA2D2, have been identified in this region [17, 18]. Frequent inactivation of several 3p21.3 genes as functional TSGs, such as RASSF1 and BLU[14, 19], by promoter CpG methylation had been identified associated with tumor initiation and progression. For example, promoter methylation of RASSF1A has been shown related to poor prognosis and advanced tumor stage of certain tumor types [20–33]. Restoration of RASSF1A in cancer cell lines inhibited tumor cell growth and metastasis . Thus, 3p22-21.3 is a critical TSG cluster in tumorigenesis [3, 18]. Deleted in lung and esophageal cancer 1 (DLEC1), a 3p22 cluster genes, was first identified as a TSG in esophageal and lung cancers . Downregulation of DLEC1 by promoter methylation has been found in multiple cancers, including nasopharyngeal [36, 37], ovarian , lung , hepatocellular , gastric , renal , and breast carcinomas , suggesting its potential as a broad TSG [44, 45]. Remarkably, DLEC1 was methylated in breast cancer as well as pre-invasive lesions but rarely in normal breast tissues, indicating its potential as an epigenetic marker for early tumors . In this study, we examined the expression and methylation status of DLEC1 in lymphoma cell lines and tissues, and evaluated its potential as a tumor marker for the early detection of hematologic tumors. Non-Hodgkin and Hodgkin lymphoma cell lines studied included diffuse large B-cell lymphoma (DLBCL) cell lines (OCI-Ly1, Ly3, Ly7, Ly8, Ly18, SUDHL6); peripheral T cell lymphoma (PTCL) cell lines (Ly13.2, Ly17); Burkitt lymphoma (BL) cell lines (AG876, BJAB, Namalwa, Rael, Raji); Hodgkin lymphoma (HL) cell lines (L428, L540, L591, L1236, KM-H2, HD-LM-2, HD-MY-Z) (DSMZ cell collection, Braunschweig, Germany); and natural killer (NK)/T-cell lines (NL) (KHYG-1, SNK6, YT) [46–48]. Cell lines were maintained in RPMI1640 or Dulbecco’s Modified Eagle’s Medium supplemented with 10% fetal calf serum (FBS) (Invitrogen, Paisley, Scotland) and 1% streptomycin/penicillin at 37°C in 5% CO2. HL cell lines were treated with 5 μM of 5-aza-2′-deoxycytidine (Aza) (Sigma) for 3 days, or further treated with 100 nmol/L trichostatin A (Cayman Chemical Co., Ann Arbor, MI, USA) for additional ~16 h as described previously [15, 49], and L428 and KM-H2 cell lines were treated with Aza for 6 days. Normal peripheral blood mononuclear cells (PBMC), lymph node samples, different types of lymphoma samples, as well as sera from healthy individuals and HL patients were collected as previously described, and the reliability and quality of all the studied samples in this study have been confirmed before [41, 47, 50]. The study was approved by Johns Hopkins Medicine Institutional Review Board. Normal adult tissue RNA samples were purchased commercially (Stratagene, La Jolla, CA, USA or Millipore-Chemicon, Billerica, MA, USA). DNA and RNA were extracted from lymphoma cell lines and primary lymphomas using TRIzol reagent (Invitrogen) as previously described [51, 52]. RT-PCR was performed as previously described [40, 41]. Primers used for RT-PCR are: DLEC1 A: 5′-ttcctccctcgcctactc, DLEC1 B: 5′-aaactcatccagccgctg; GAPDH33: 5′-gatgaccttgcccacagcct, GAPDH55: 5′-atctctgccccctctgctga. RT-PCR was done with 32 cycles for DLEC1 and 23 cycles for GAPDH. Bisulfite modification of DNA, methylation-specific PCR (MSP) and bisulfite genomic sequencing (BGS) were performed as described [53, 54]. MSP primers for DLEC1 were: DLEC1 m1: 5′-gtttcgtagttcggtttcgtc; DLEC1 m2: 5′-cgaaatatcttaaatacgcaacg; DLEC1 u1: 5′-tagttttgtagtttggttttgtt; DLEC1 u2: 5′-acaaaatatcttaaatacacaaca. For BGS, bisulfite-treated DNA was amplified using primers DLEC1 BGS1: 5′-gaagatataaatgtttataatgatt; DLEC1 BGS4: 5′-aactacaaccccaaatcctaa. ANKRD30A m1: 5′-cggtagttgttatttgtacgc; ANKRD30A m2: 5′-tcctctctcaataaaatcgcg. MSP and BGS were performed for 40 cycles by using the AmpliTaq-Gold DNA polymerase (Applied Biosystems). All primer sets were previously tested for not amplifying any unbisulfited DNA. Amplified BGS products were cloned and 5 to 10 colonies were randomly chosen for sequencing. We first examined the expression of DLEC1 mRNA in 25 non-Hodgkin and Hodgkin lymphoma cell lines by RT-PCR. DLEC1 was highly expressed in the normal lymph node, PBMC samples, as well as human adult testis and bone marrow tissues (Figure 1A), but silenced or reduced in 33% (2/6) DLBCL, 50% (1/2) PTCL, 100% (5/5) BL, 86% (6/7) HL, and 67% (2/3) NL cell lines (Figure 1B), indicating that DLEC1 is a candidate TSG for lymphomas. 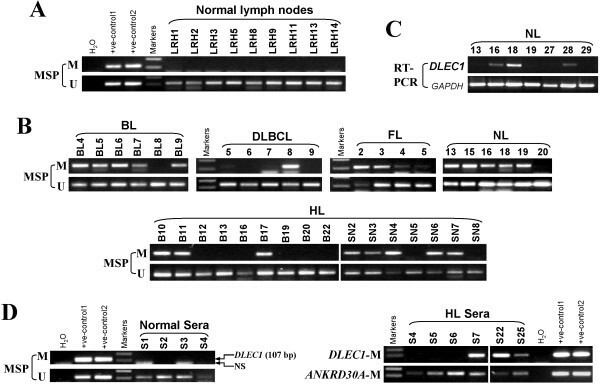 DLEC1 is downregulated in lymphoma cell lines. A. Expression analysis of DLEC1 in normal adult tissues, lymph nodes, and PBMC samples. B. Representative analyses of DLEC1 expression by RT-PCR in lymphoma cell lines. GAPDH was used as internal control. B.M: bone marrow; DLBCL: diffuse large B-cell lymphoma; PTCL: peripheral T cell lymphoma; BL: Burkitt lymphoma; HL: Hodgkin lymphoma; NL: nasal NK/T-cell lymphoma. The promoter and exon 1 region of DLEC1 is a typical CpG island, with a T/C SNP site at CpG#29 (Figure 2A). MSP analysis showed that DLEC1 promoter methylation was frequently detected in 3/6 DLBCL, 1/2 PTCL, 5/5 BL, 7/7 (one weak) HL, and 2/3 NL cell lines (Figure 2B; Table 1), well correlated with its silencing or reduction. DLEC1 methylation was further verified in detail by BGS analysis of 61 CpG sites within the CpG island. CpG sites of DLEC1 examined were heavily methylated in BL cell lines Rael, Raji, and in the HL cell line L428, but rarely in all normal PBMC samples, which confirmed the MSP data (Figure 2C). These results indicate that DLEC1 silencing by promoter methylation is a critical event in lymphomagenesis. Promoter CpG methylation of DLEC1 in lymphoma cell lines. A. Diagram shows the DLEC1 CpG island, exon 1 (indicated with a rectangle), and CpG sites (short vertical lines). Numbers from 1 to 61 indicate the individual CpG sites. B. DLEC1 methylation as measured by MSP in lymphoma cell lines. M: methylated; U: unmethylated; DLBCL: diffuse large B-cell lymphoma; BL: Burkitt lymphoma; HL: Hodgkin lymphoma; NL: nasal NK/T-cell lymphoma. C. High resolution mapping of the methylation status of the DLEC1 promoter by BGS in normal PBMCs, and representative BL and HL cell lines. The DLEC1 transcription start site is shown as bent arrows. Circles, CpG sites analyzed; row of circles, an individual promoter allele that was cloned, randomly selected, and sequenced; filled circle, methylated CpG site; open circle, unmethylated CpG site. To further confirm whether promoter methylation mediates the loss of DLEC1 expression in lymphoma, lymphoma cell lines with methylated and reduced DLEC1 were treated with the DNA methylation inhibitor, Aza, alone or combined with the HDAC inhibitor trichostatin A (TSA). After Aza treatment, DLEC1 expression was significantly induced in cell lines Rael, L428, L1236 and KM-H2. MSP analysis showed increased unmethylated alleles. Similar results were obtained using a combination treatment of Aza and TSA (Figure 3). Demethylation of the DLEC1 promoter was further confirmed by BGS. These results confirmed that promoter CpG methylation directly mediates DLEC1 silencing in lymphomas. Pharmacologic demethylation restored DLEC1 expression in methylated/silenced lymphoma cell lines. A. Expression and methylation analyses of DLEC1 in HL cell lines with Aza treatment or combined with TSA (A+T). M: methylated; U: unmethylated. B. BGS analysis of DLEC1 methylation in lymphoma cell line KM-H2 before and after 5 μM Aza treatment. We next investigated DLEC1 methylation in different types of primary lymphomas. Of 58 lymphoma tissues, DLEC1 methylation was detected in 5/6 (83%) BL, 16/30 (53%, one weak) HL, 1/10 (10%) DLBCL, 6/8 (75%) NL, and 4/4 (100%, two weak) follicular lymphoma (FL) tumor samples, while no methylation was detected in normal lymph node samples (Figure 4A and B; Table 1). Unmethylated bands were detected in all samples due to the inevitable inclusion of non-tumor cells in the analysis. Furthermore, the reduction or silencing of DLEC1 expression was observed in 6 out of 7 (86%) NL tumors as measured by RT-PCR. DLEC1 is frequently methylated in lymphoma tissues. 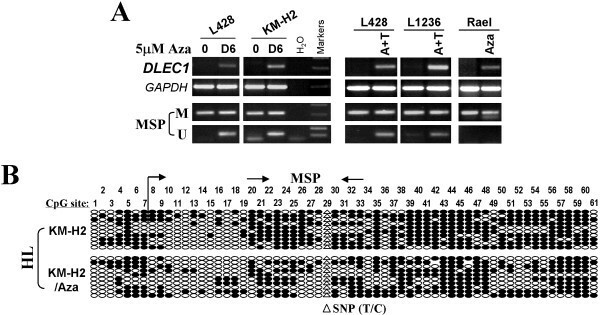 A. MSP analysis of DLEC1 methylation in normal lymph node samples. Templates used for positive controls are: bisulfite treated DNA from HCT116 (+ve-control1) and HT-29 (+ve-control2) cell lines for methylation; SW480 (+ve-control1) and SNU16 (+ve-control2) cell lines for unmethylation. B. Representative analyses of DLEC1 methylation in primary lymphomas by MSP in primary lymphoma BL, DLBCL, HL and FL samples. BL: Burkitt lymphoma; DLBCL: diffuse large B-cell lymphoma; HL: Hodgkin lymphoma; NL: nasal NK/T-cell lymphoma; FL: follicular lymphoma. 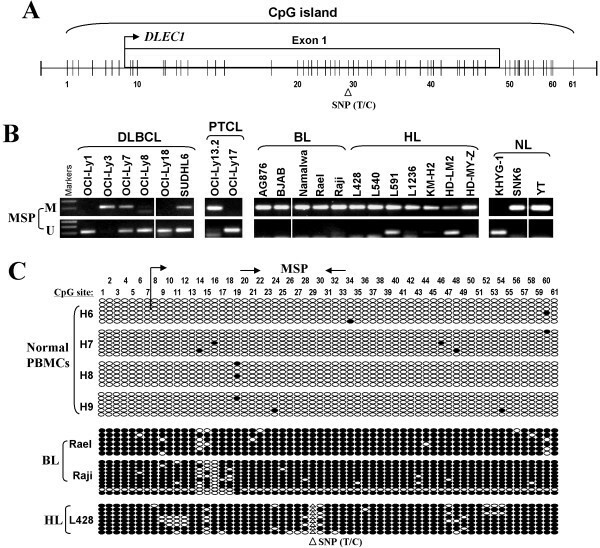 C. Representative analysis of DLEC1 expression in NL tumors. GAPDH was used as an internal control. D. Representative MSP analysis of DLEC1 methylation in serum samples from HL patients and normal controls. Positive controls: bisulfite treated DNA from HCT116 (+ve-control1) and HT-29 (+ve-control2) cell lines. M: methylated; NS: non-specific band. Furthermore as a pilot study, we examined DLEC1 methylation in serum samples of 13 HL patients with sera from 20 healthy individuals as controls. ANKRD30A is a normally methylated gene, thus used as an internal control for validating genomic DNA integrity of these samples, in addition to unmethylated DLEC1. Results showed that DLEC1 methylation was detected in 3/13 (23%) sera from HL patients (Figure 4D) but not in any normal sera. DLEC1 is located in the commonly deleted region 3p22-21.3 [3, 18]. A cluster of TSGs, including RASSF1A, BLU, and CACNA2D2, has been identified within this region. Silencing of RASSF1A, BLU, as well as DLEC1 by promoter CpG methylation had been extensively identified in multiple human cancers. Notably, promoter methylation of several 3p22-21.3 TSGs, such as RASSF1A and BLU, has also been identified in lymphomas [50, 55], suggesting that TSGs in this region are frequently susceptible to epigenetic disruption during lymphoma pathogenesis. Here, we report that DLEC1 is frequently silenced by promoter methylation both in lymphoma cell lines and primary lymphomas, but seldom in normal lymph nodes and PBMCs. Pharmacologic demethylation could reactivate DLEC1 expression, suggesting that epigenetic mechanism including DNA methylation and histone modification mediates DLEC1 transcriptional silencing. As primary tumor tissues usually contain infiltrating non-malignant cells such as lymphocytes, unmethylated alleles were detected in all the tumor samples which also acting as an internal control for genomic DNA integrity. DLEC1 unmethylated alleles and ANKRD30A methylated alleles detected in different types of normal and lymphoma samples indicated the reliability of these samples as shown before. DLEC1 methylation showed a relatively low frequency in DLBCL samples, compared to other lymphoma types. The reason for this difference is not clear probably due to the special biologic features of DLBCL, which needs to be further confirmed by large sample size. Our results suggest that epigenetic silencing of DLEC1 is important for lymphoma pathogenesis. Remarkably, DLEC1 is specifically methylated in sera of HL patients, suggesting its potential as an epigenetic biomarker for the non-invasive diagnosis of lymphomas. This study identifies the frequent epigenetic inactivation of DLEC1 in various lymphomas and demonstrates its potential as a non-invasive tumor marker for the detection of lymphomas. More molecular studies on the tumor suppressive functions of DLEC1 in lymphoma pathogenesis are needed. Zhaohui Wang, Lili Li contributed equally to this work. This study was supported by National Natural Science Foundation of China (# 81071634 and 81172582), Shenzhen Science Fund for Distinguished Young Scholars (#JC201005270328A) the Leukaemia Lymphoma Research of the United Kingdom and the grants from The Chinese University of Hong Kong. We thank Dr. Riccardo Dalla-Favera for the DLBCL cell lines, Drs. Teresa Marafioti and (David Y Mason) for the L1236 cell line, Drs. Norio Shimizu for the SNK-6 lymphoma cell line. ZW and LL analyzed data and drafted the manuscript. XS and ZW acquired data. ZG, GS, PGM and AR provided material and reviewed the manuscript. PGM contributed to the writing of the manuscript. QT conceived and supervised the study, analyzed data and finalized the manuscript. All authors read and approved the final manuscript.